Across the bay from Tokyo, a 2-megawatt wind turbine owned by Tokyo Gas rises into the sky from a patch of ground surrounded by chemical plants, oil refineries, and tanks holding liquefied natural gas. A smaller 1.5-megawatt wind turbine from Ebara Corp. turns steadily nearby, churning air tinged with the smell of oily rags. The two turbines may be an apt metaphor for renewables in Japan. While clean energy is starting to make inroads, the path may at times seem like those two lone wind turbines standing out amid a sea of oil and gas. Japan’s energy policy in the wake of the Fukushima nuclear disaster eight years ago has been offering a mixed bag of support for renewables but also providing heavy, almost enthusiastic, support for conventional sources of energy such as oil, gas and coal. But signs of change have recently started to multiply, with big corporations such as Ricoh Co. and Sony Corp. — and even some of the country’s biggest utilities and trading houses – beginning to embrace green energy enthusiastically. 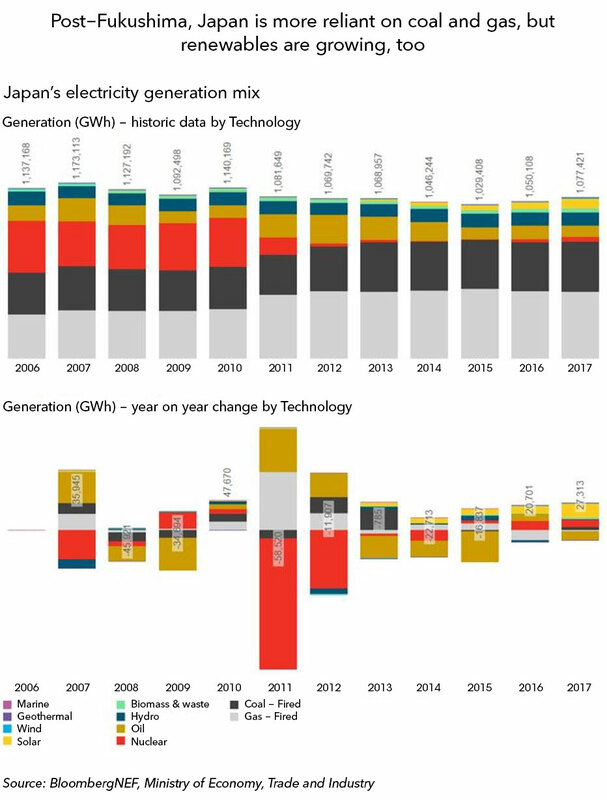 BloombergNEF’s 2018 New Energy Outlook, published last summer, captured the mixed noises, forecasting that Japan’s electricity system will remain heavily reliant on fossil fuels, particularly coal, for at least the next three decades (client links web | terminal). Nuclear is expected to make a comeback to some degree and renewables will see strong growth, but coal will become the dominant technology in the Japanese power system from 2023 onward, BNEF projected. And while gas has become the biggest source of generation in the immediate aftermath of Fukushima – rising from 29 percent of the generation mix the year before Fukushima (2010), to 41 percent in 2017 – its gains are expected to be only temporary. To varying degrees, restarts will mean nuclear will account for anywhere from 21 percent of Japan’s electricity mix by 2030 (the government’s forecast) to a more modest 12 percent (BNEF’s forecast). What is to be made of this story of contradictions and what are the implications for the future? To better address these questions, and to understand why Japan’s energy policy may differ from other countries, some context is needed. Japan’s energy landscape has been shaped by two huge events in the country’s history – the oil shocks of the 1970s and the Fukushima earthquake and tsunami on March 11, 2011. In the 1970s, the surge in oil prices – an embargo by Arab oil producers saw prices soar from about $2 per barrel to almost $12 by 1974 – reminded Japanese policy-makers of the nation’s fragility. Almost completely reliant on energy imports, Japan at the time was importing 45 percent of its oil from Arab countries. The remainder came from Iran, Indonesia and a few other sources. At the time, Japan was the world’s second-largest consumer of petroleum, the leading importer and one of the world’s largest economies. Shaken by the sudden spike in oil prices and concerned at how vulnerable the economy and the country had become to outside supply shocks, policy-makers embarked on an ambitious program to build nuclear reactors to diversify how Japan generates its electricity and to bolster energy security. The number of reactors in the country ballooned from five in 1973 to 54 just before Fukushima, making Japan the world’s third-largest generator of nuclear electricity behind the U.S. and France. More nuclear was in the pipeline as Japan’s leaders pressed for a more environmentally friendly energy policy. In June 2010, Japan’s Ministry of Economy, Trade and Industry said the nation should boost energy self-sufficiency to 70 percent by 2030, both for security and to meet CO2 emission targets. Nuclear power was to help meet those goals, necessitating the construction of new reactors. An uneasy calm existed between the public, industry and governments – both local and national. Though fears about nuclear safety persisted, especially after a major fault-line had been discovered under the world’s biggest nuclear power station, the 8-gigawatt Kashiwazaki-Kariwa plant in the prefecture of Niigata, following an earthquake in 2007, an uneasy truce had set in. Local communities extolled the economic benefits of reactors, industry promoted the access to reliable base-load power and the national government promoted both the security and climate advantages. When the magnitude 9.0 earthquake struck off the northeast coast in March 2011, producing a powerful tsunami and leading to the meltdowns at Tokyo Electric’s Fukushima plant north of Tokyo, Japan’s energy policy was thrown into disarray. Almost overnight, much of the nation’s nuclear generation evaporated as the public suddenly turned against atomic energy. To fill the hole, Japan turned to gas and oil. In 2013, a mere two years after Fukushima, Japan was generating 42 percent of its electricity from gas, while oil accounted for 15 percent and coal 31 percent. After Fukushima, energy security was thrown into the limelight once more, while the nation’s leaders grappled with the demands of industry to keep the lights on while also trying to satisfy Japan’s desire to be seen as a good player in climate circles. The centerpiece of Kan’s push to ween Japan off nuclear was the passage of legislation to introduce feed-in tariffs to promote more solar, wind, and geothermal. The impact of the feed-in tariffs, officially put into effect on July 1, 2012, was profound. Utility-scale solar soared more than 100-fold from 370 megawatts in 2010, the year before Fukushima, to almost 38 gigawatts at the end of 2017, according to BNEF. Wind rose from 2.3 gigawatts, to 3.5 gigawatts in 2017. Biomass and waste went from 3.2 gigawatts to 4.3 gigawatts. Japan’s annual new investment in renewable energy capacity, already starting to pick up even before Fukushima, rose from $7.3 billion in 2010 to a peak of $37.3 billion in 2014. Investment has slowed somewhat since then, but still totaled $17 billion in 2018, behind only China and the U.S., according to the latest figures from BNEF. Nevertheless, the results of this investment in terms of the generation mix have been modest so far – partly because Japan paid generously (by international standards) for its new solar plants. Eight years after the most powerful earthquake ever recorded in Japan rocked the nation, solar accounts for just 6 percent of the nation’s electricity generation. Wind is even lower at just 0.8 percent. “Clearly, gas is the winner after Fukushima,’’ says BloombergNEF head of Japan analysis Miho Kurosaki. Even so, however slowly, Japan’s energy landscape is beginning to change. Consider what’s happening with the world’s dirtiest fossil fuel. While Japan has plenty of new coal-fired thermal plants in the offing – BNEF estimates coal will account for 36 percent of the country’s electricity mix in 2030 – some new projects are being canceled. In January, utilities Tokyo Gas, Idemitsu Kosan and Kyushu Electric scrapped plans to build a coal-fired plant in Chiba. Instead, Tokyo Gas and Kyushu Electric said they’d decided to continue studying the feasibility of building an LNG-fired plant at the same location in Sodegaura City in Chiba. JFE Steel Corp. and Chugoku Electric Power Co. in December said they’d abandoned plans for a new coal-fired power plant near Tokyo and would instead consider building natural-gas fired generation. The decision by the two companies came in the wake of criticism from two former environment ministers. Also earlier this year, the Nikkei newspaper reported that Kansai Electric and trading house Marubeni Corp. had scrapped their plan for a 1.3-gigawatt coal-fired power plant in Akita, adding to 4 gigawatts of coal projects already canceled in Japan since last year. In September, Marubeni said it aimed to cut its coal-fired power plant portfolio in half by 2030 and would stop making investments into new projects. It also wants to double the amount of renewables in its power supply to 20 percent by 2023. Other trading houses, which had until recently been riding a surge in coal prices to overcome a slump in earnings, have also backed away from the coal that’s used in power plants, though they’re sticking with mining and selling coking coal. In February, Itochu Corp. said it sold its 12.5 percent interest in the Rolleston thermal coal mine in the Australian state of Queensland. Mitsui & Co., another trading house, in October said it would make no new investments in thermal coal mining projects. Mitsubishi Corp., yet another, said in December that it would pull out of thermal coal operations altogether with the sale of its unit’s 10 percent interest in the Ulan coal mine in Australia’s New South Wales and a stake of slightly more than 30 percent in the Clermont coal mine in Queensland. While the Ministry of Environment has voiced concerns about carbon emissions from Japan’s coal-fired fleet, the decisions to scrap the plants are also being driven by economics. Gross electricity demand in Japan is expected to drop from 1,075 terawatt-hours today to 1,010 terawatt-hours in 2030, BNEF estimated in July (web | terminal). Moreover, PV costs in Japan will converge toward global benchmarks after the country phases out its feed-in tariff program. This will enable solar to compete with gas, and eventually undercut new coal after 2025, BNEF said in its 2018 New Energy Outlook. Corporate Japan is starting to step more boldly into renewables. While Japan’s power market design prohibits large-scale clean energy purchasing and a clean energy certificate market has struggled to establish itself, that hasn’t stopped some of the country’s largest companies from committing. In September, Sony Corp. said that it planned to rely on renewables for electricity at all its business sites by 2040 and that it had joined the RE100, a consortium of more than 160 companies worldwide committed to using 100 percent green power. Ricoh Co., a maker of printers and copiers, was the first Japanese company to join RE100 when it signed up in April 2017. The Tokyo-based company has said clean energy will supply 30 percent of the electricity used at its offices and factories by 2030 and 100 percent by 2050. “If the Japanese market and Japanese industry don’t change and don’t make any efforts to decarbonize or adopt more renewable energy, Japan itself and Japanese industry will get weaker and weaker in the global supply chain,’’ Sergio Kato, a vice president at Ricoh and overseer of the company’s sustainability efforts, told BNEF in an interview in June (web | terminal). In total, 15 Japanese companies belong to RE100, including Fujitsu, Sekisui House, Daiwa House Group and the Nomura Research Institute, one of the largest tallies for any country. Others are also trying to get in on the game. Rakuten Inc., the country’s biggest e-commerce provider, recently launched the Rakuten Energy Trading System, a trading platform using blockchain technology to facilitate the exchange of J-Credits — carbon offset credits certified by the Japanese government. The country, which is aiming to cut greenhouse gas emissions by 26 percent in 2030 relative to 2013 levels, in May kicked off a non-fossil certificate market backed by renewable power generated under the feed-in tariff program. One area where Japan has had almost no success is in developing its geothermal resources. In fact, since the year before Fukushima, geothermal generation in Japan has dropped about 15 percent – a curious development since the island nation has the potential to produce as much as 23,000 megawatts of power from underground heat, Japan’s New Energy and Industrial Technology Development Organization, or NEDO, has estimated. According to BNEF, Japan’s geothermal capacity has remained at about 555 megawatts for almost two decades, with virtually no new capacity added. Electric vehicles are also a strange weak spot for a country that’s home to some of the world’s biggest automakers. While Toyota Motor Corp. was one of the first to see the potential in new energy vehicles with the launch of its Prius hybrid more than two decades ago, and Nissan Motor Corp. produces the world’s best-selling battery electric vehicle with its Leaf model, EVs made up only 0.7 percent of new car sales in Japan in 2018, at 50,000 units, compared to 3.2% in the world as a whole. BNEF expects EV unit sales to total 1.6 million in China alone in 2019. Back out in Chiba, on a sunny day in early March, the wind blows strong, the Ebara wind turbine turns slowly and a few fishermen throw lines out into the water. But things may be about to change. In recent months, Japan’s parliament has passed legislation to make the development of offshore wind easier, with the designation of five exclusive zones for auction to developers. Companies are now jockeying for position in this new market. Tokyo Electric Power Co. Holdings Inc., the company behind the wrecked Fukushima reactors, is considering building an offshore wind farm off the coast of Chiba. Meanwhile, Orix Corp., which leases everything from computers to aircraft, says it, too, is studying an area off the coast of Choshi in Chiba prefecture facing the Pacific Ocean. Jera Co., a joint venture between Tepco and Chubu Electric Power Co. and the world’s biggest buyer of LNG, said in December it’s buying a quarter of the operating 172.8-megawatt Gunfleet Sands offshore wind farm off the coast of southeast England from Marubeni Corp. and almost a third of the under-construction 128-megawatt Formosa 1 project in Taiwan. The projects in England and Taiwan are a stepping stone, with Jera promising to use the experience it gains during the construction to move forward with projects in Japan. BNEF is taking this offshore wind push seriously, in December nearly trebling its forecast for cumulative Japanese offshore wind installations in 2030, from 2 gigawatts to 5.9 gigawatts. Clients can view that report on these links (web | terminal). This would put it into the top-10 global offshore wind markets in the 2020s, from almost nothing today. Our analysts now expect most of the capacity built to be the fixed-bottom turbines familiar in established markets, rather than the fledgling floating versions with which Japan has previously been associated. A Research Note on Japan offshore wind, due to be published in coming days, will explore prospects further. Some day in the future, Chiba’s air may not smell quite as heavily of oil and gas, and many more wind turbines may dot the coast.